Building my own craft business was probably one of the most rewarding and valuable experiences I've ever done for myself. Closing that business, letting go and moving on was an internal debate that took me a couple of years to come to terms with. Today I'm going to launch a series that provides a transparent reflection of my journey building the Wicked Candle brand, in hopes to pass on some of my key learnings to future entrepreneurs. There are tools that can help mitigate these risks to promote more sustainability, stability and long-term prosperity. But sometimes despite how much effort or energy that goes into it, that difficult decision has to be made. In 2011, I leveraged my professional background in branding, marketing and project management to launch a hand-poured candle craft business in Boston, called Wicked Candle. I had always had an inkling that I wanted to go into business for myself. 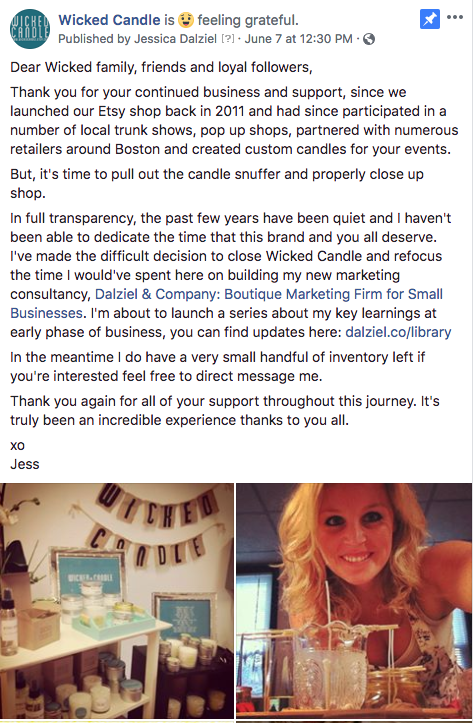 Wicked Candle was a side hustle; I treated this like a pilot program to see if I could learn first-hand what it was like to own and operate my own business. Going into this I wasn't diving in feet first, more like dipping my toe in the pool. I was still living off of my day job and wasn't dependent on my income from Wicked Candle, which I know has a considerably different perspective regarding mindset and motivation. I'll elaborate more on why I decided to start my own company in Part II of this series. I was lucky to experience more success with Wicked Candle than I had anticipated. I was also experiencing growth in my day job and decided that I wanted to earn an MBA. What did this mean for Wicked Candle? Well, at the time I was hoping I could continue to identify ways to truly make that business prosper. Behind the academic scene, I figured I could use Wicked Candle as my personal case study throughout my studies. Carrying the physical product with me to Dublin wasn't realistic so I needed to figure out how I could maintain the integrity of my product while selling from abroad. Before I could outsource, I needed to be very clear on dividing roles and responsibilities. What could I do while in school full time? What could I do from abroad? What would I be dependent on others for? Making those decisions was a little easier for me because at that point I had been running Wicked Candle for a few years. I understood the full scope of what those roles and responsibilities were, which isn't always as easy as you think (particularly if you're planning this and just starting out). After making those decisions, I decided outsource to another professional candlemaker, who I had paid to produce inventory and manage fulfillment. This would maintain the integrity of the hand-poured candles and allow me to focus on sales, retailer outreach, branding and marketing. I also needed to make some sacrifices, such as participation in local markets or events. What was my contingency plan if that candlemaker became unavailable at short notice? How will I handle quality control of the product? What if this candlemaker starts to sell competitive products that would pose a conflict of interest? What if the candlemaker suddenly becomes unresponsive? Much of the above can be cleared through not only conversations where expectations are outlined and set early on, but documenting those decisions and coming to a formal (written) agreement. At the time, I naively relied purely on trust, as my professional relationship with that candlemaker was friendly and informal. However, life events (on both sides) can have an impact on the initial agreements and not having a formal plan in place from the start was somewhat of a rookie mistake on my part. I lost connection with my supporters. By not making the candles myself (or physically being near where the candles are made), it was so difficult to get new and updated 'behind the scenes' photos that my supporters grew to love. There are only so many pics of candles that you can post without consumers getting tired of it. I noticed that people love people, they loved the posts that featured the people behind the product. Those became a bit more sparse. My value prop was heavily centered on the local aspect. But I wasn't local anymore! This really started to erode my messaging and chip away at the meaning behind my brand values. Going back to the previous section about why people close, I did not have the same amount of capital to reinvest back into the business and it wasn't make that much money on its own. I had quit my day job and invested in a full-time MBA program. I simply did not have the expendable income that I previously had while working full-time. The costs were very high, if I were to continue down this avenue and eventually go full-time into this product business I would need to figure out a way to increase the profitability while being able to scale. Competition was fierce! How many scented candle companies can you name off of the top of your head? Let's say you don't even know the name of the company, but a simple stroll down the aisles of Target would prove that there is such a strong variety of candle designs and in order to stay competitive I needed to keep my prices somewhat low and reasonable (hence, the low margins because I didn't have the same economies of scale as Tar-jay and the like to keep my raw materials costs low!). I literally couldn't compete. Because all of the above reasons (and a few others not listed! ), there was very little value to the business in terms of selling it to someone else. I didn't have a strong enough presence. There are a variety of reasons as to why a small business owner might decide that it is time to close its doors. Because a business truly feels like a living organism, it's hard to pull the plug and let go. However, making that difficult decision can sometime open the doors to new and exciting opportunities that you didn't previously imagine. Have you sold your company? Please share your story with us below!